After years of ugly looking CGI ruining some great movie moments, a lot of directors are going back to the old school method of having these ideas realized with real working special effects. Count director David F. Sandberg into that camp. With his most recent sequel in theaters this weekend, the filmmaker has admitted that one of its best scares was done 100% practical. Bloody Disgusting recently caught up with director David F. Sandberg to discuss Annabelle: Creation. And the climactic end scene was a point of conversation that needed some analysis. If you haven't had a chance to see the movie just yet, you might want to save this cool reveal for a later date, as there will be SPOILERS ahead. Annabelle 2 is racking up some great reviews. And the ending helps push this one home as a great recent horror outing that definitely outshines the first Conjuring spin-off. At the heart of this wicked tale is a killer doll known only as Annabelle. While the original outing plodded along, meandering and wasting time, Annabelle Creation is a relentless scare fest. The 109 minute runtime has some excellent jump scares. But the ending truly delivers the goods. In this scene, Linda, played by Lulu Wilson, is trying to escape Talitha Bateman's possessed character Jancie by using the house's old dumbwaiter. This results in Linda landing in the basement. The drop has disoriented her. And it takes the girl a second to realize that the top part of Esther Mullins' dead body is lying in front of her. A beat passes, and the corpse jolts to life crawling towards our hero like some kind of inhuman abomination. Linda only escapes at the last second. It's a scene that's guaranteed to shave at least three years off your life. Bloody Disgusting chatted with Sandberg about this particular scene, and this is what he divulged. "When we were putting the movie together in the edit I was like, it needs something extra here. I was sort of joking with Michel, the editor, that maybe they just find half of Mrs. Mullins and she was like 'Yeah!' Instead of laughing it was 'Okay, let's do that,' so that was a late addition and we had that scene we shot later on with her crawling on the floor." Seeing as how this moment came late in the game, it was assumed that the scene was achieved through a digital assist with some well placed CGI. But it absolutely wasn't. Sandberg claims there was no digital effects at all in the hair-raising moment. He goes onto explain. "I got to work with an amputee. That wasn't CGI. I asked, 'Can we find someone without legs?' which freaked everyone at the office out. But we found this woman without legs who was totally up for it and so into it and she kind of looks like Miranda [Otto]. We had some blood and hair and stuff to her face to cover it up a little bit, but yeah. That's one of those weird things I've always wanted to do... work with amputee people in horror movies because they can do cool things." And thus, one of the great scares of summer was born. 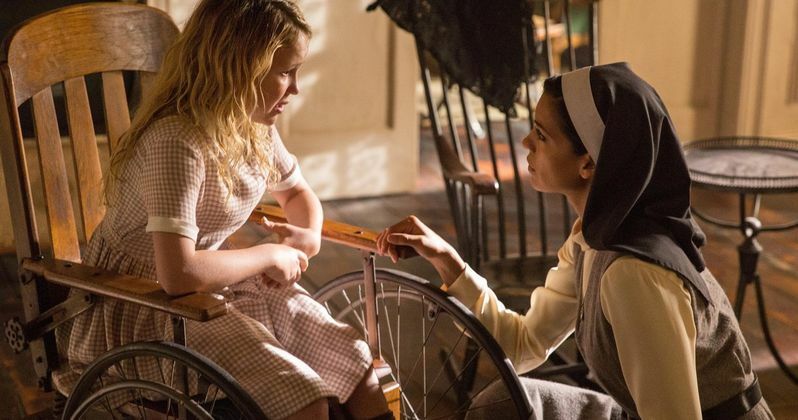 Once again, The Conjuring universe waited until the last moment to add possibly its best scene, a scenerio shared by the addition of the Nun in Conjuring 2. Annabelle: Creation is currently playing in theaters. And it looks poised to beat last week's box office winner The Dark Tower with its hand tied firmly behind its back. Go tonight. Get scared.